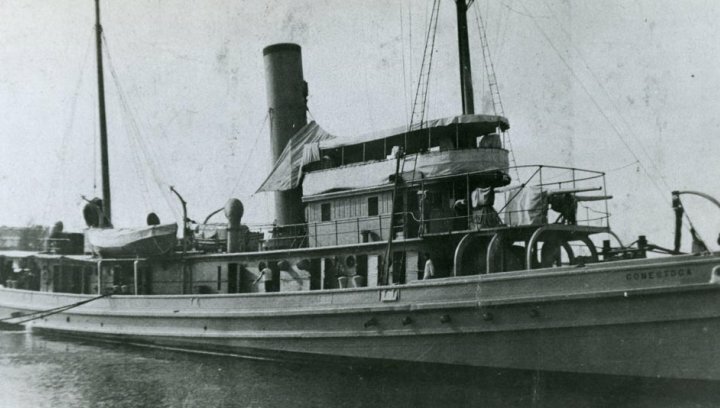 In a mystery that goes back nearly 100 years, the US Navy along with the National Oceanic and Atmospheric Association have found the USS Conestoga. The Navy tug boat was lost in 1921 along with all her 56 man crew after departing San Francisco toward Pearl Harbor, Hawaii. When the ship failed to show up to port a massive rescue effort was launched, captivating the country similar to the missing Malaysian Air plane in recent history. The effort to find the Conestoga involved 60 ships and dozens of airplanes covering an area 300,000 square miles. But now the US Navy and NOAA officials have confirmed publicly that the Conestoga sunk in a National Marine Sanctuary off the Farallones Islands. The area off the coast of San Francisco is known for its shipwrecks, accumulating the remains of some 300 vessels. In 2009, while doing a sweep of the area with sonar, researchers discovered a shipwreck that was not yet documented. After many dives with remotely operated vessels and a two-year investigation, they were finally able to confirm through the presence of a large gun on deck that it was in fact the Conestoga, according to a press release by NOAA. Watch the video below as James Delgado, Director of Maritime Heritage for NOAA’s Office of National Marine Sanctuaries.